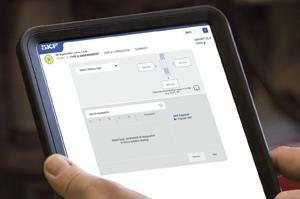 SKF recently introduced a new online tool to make the process of selecting and evaluating a bearing faster and easier. The latest version of SKF Bearing Select is intended to provide users with a quick, easy and accurate evaluation tool for bearing performance. Designers can access the tool online and enter the relevant values. The software then uses engineering knowledge to evaluate bearing performance and calculate the results, such as rating life, bearing loads, relubrication interval and frequencies. In addition to being more intuitive, the new version enables users to quickly perform calculations on the fly. Results are displayed while input parameters are still being entered and then presented automatically in a report, which includes up-to-date graphics. Automated reports can be generated within 60 seconds. "SKF Bearing Select automatically generates a bearing report and allows the user to save calculations for future reference or modifications," says Francisco Serrano, SKF’s manager for product line engineering tools. While original equipment manufacturers (OEMs) are the target audience for the new software, any user who needs to evaluate the performance of a bearing based on the operating conditions, such as loads, speeds and lubrication, could benefit from using it.